I surprised the lil' dude Friday with some new mermaids for bath time. From the Dollar Store. That girl couldn't wait to get into the tub! 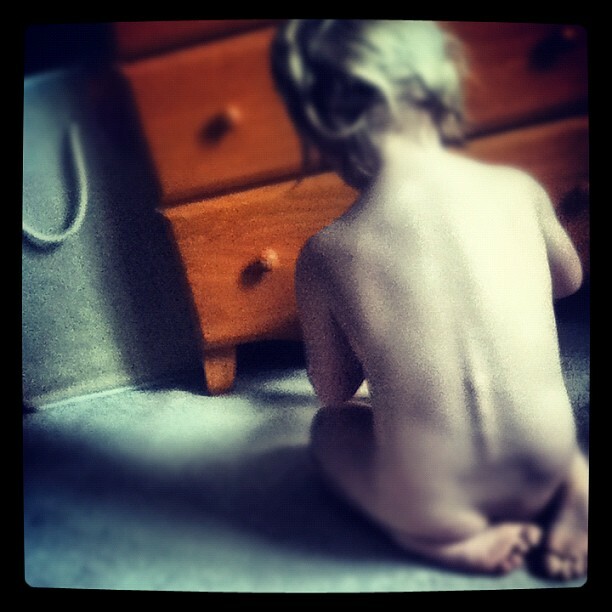 I wish I could be more like her, reveling in the simplest and smallest of pleasures. The smile on her face when I handed her the 4 little pieces of plastic Chinese crap was priceless and unfeigned. Genuine happiness. I watched her in the bathtub a few times this weekend, in and out of the bathroom as I completed the rest of the lists in my life. She played and sang to herself until the water ran cold. My daughter, always one to make the most out of any situation, squeezing every last drop of goodness out of everything she can. It was then as I wrestled her 39 pounds into her hooded name towel, and slathered her goosebumped body with lavender Aveeno (just as I did when she was brand-new) I realized that while she is change, change, changing on a daily basis, she's staying the exact same. The root of what makes her HER is still strongly intact deep inside. She still loves and requests bath time. When she starts to melt in the evenings, a suggested bath is all it takes to light her face back up. The girl will sleep 12-14 hours every night; and goes to bed without a fight. But she's not a morning person. She has a high tolerance for pain, sometimes it startles me how little pain and affliction appears to affect her. She's a comfort seeker in her NaNa and lil' Beagle stuffed lovey. She still brings them with each morning when we leave the house, and leaves them in her carseat all day. For all I care, she can continue this practice until she's 20. She loves to pick out books at bedtime, and insists no pages are skipped in her favorites. She won't drink chocolate milk. Goldfish are still her #1. She craves alone time and her independence. She still requests special trips to her Grandparents' by herself. Her favorite haunts are still Target, the coffee shop, library, Barnes & Noble, and Daddy's happy hour spot. And she, absolutely without a doubt, is still my very, very most favorite there ever was.